Son, I hate you. How come your iris is bigger? How come your eyelashes are longer and curlier? How come your eye is bigger? How come my recipe come out so nice? Somemore never thank me for the nice pair of eyes. because I am too free liao. Next Next post: Let’s recyle our first post! Never mind, I go make coloured contact lens which will make my iris bigger too. Blue? Pink coloured contacts *LOL* … but grey quite nice oso wor. mendee – I only wear my contact lense after 12 noon cos my eye doctor warned me not to wear it for too long. I kena one bad infection and really afraid of that now. wow.. nice eyes and eyelashes !!! i want !!! hmmmmm.. just a thought. 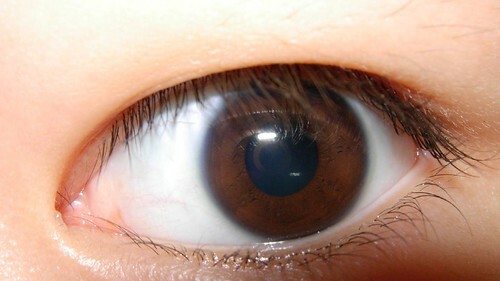 if biometric uses iris for person verification, if u post up ur iris like this, can it be used for identity theft? That day i told u i love his eyes and u said its made out of 2 scoops of Hagen Daaz ice cream and now u jeles pulak!